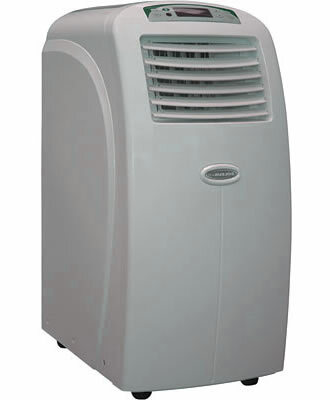 When you can't afford to have a house-wide AC system installed in your home, a cheaper alternative is a free standing, portable air conditioner unit that you can move from room to room as you need it. This is a popular option for people on tighter budgets that still need some form of powerful cooling during very hot summers. Some models are very powerful yet are relatively compact, so can be used in different areas of the home for best effect. So let's take a look at what these devices are, how they work and what the cost in terms of energy consumption. What is a Portable Air Conditioning Unit? This is a smaller version of the fixed AC that you see installed in homes and offices. Instead of it needing to be permanently connected to an outside wall through which it is vented via an external pumping unit, a portable unit is moveable (on wheels) making it much more versatile. These movable appliances are generally more compact than their fixed counterparts and depending upon output rating, tend to use less energy. However, if this kind of unit is used in a larger room on the high setting for a long period of time it will still consume a lot of costly energy. The major problem people come up against when they first take delivery of their first free standing AC machine is what to do with the length of corrugated plastic pipe that the instructions say must be connected to the back of the unit. This is the exhaust venting duct and it must be placed through an opening in an external wall of the building. The reason for this is all air conditioning devices generate hot air as a by-product of the heat exchange process they use to produce the cold air that cools us down. That hot air must be vented outside. Failure to do so will result in the appliance creating more hot air than cold and you ending up with a net temperature increase in the room it's being used in! How Does a Free Standing AC Work? The principle is the same as a fixed AC unit, although all of the process goes on inside a single unit instead of the split units used by a fixed AC. To get an idea of how this works, let's look first at a fixed unit. With a fixed installation, the in-room unit produces cold air by passing room temperature air through a refrigeration process similar to the way your domestic fridge works. There is a compressor that forces air through a heat exchange where a refrigerant gas chills it and a fan pushed the chilled air into the room. The heat exchange process does what it sounds like it does, which is to create both hot and cold air from the intake. The hot air is channelled through an exhaust duct which is connected to the outside unit where fans draw the heat out into the atmosphere. As the appliance cools the air inside the room and draws off heat it also acts as a dehumidifier, taking moisture out of the air in the room. This is desirable in areas of high humidity where the heat can be more draining and make you feel more tired. How Does a Portable Vent Hot Air? Our portable device works along the same lines with the difference being it is not connected to an outside unit to draw the hot air away. In its place, it has a movable vent that you can either fix to a suitable opening in an external wall such as a fan outlet, or do what most owners do and hang it out a nearby window. Most portables come with window venting kits which provide you with a way to block the gap in the window that is created by having it open to pass the exhaust vent through. These work best on windows that open by sliding one pane of glass over another, but not so well on windows that open in- or out-wards like a door (there is a gap top and bottom which is not so easy to plug). Many people in this situation find something to stuff into the gaps to keep the heat on the outside and the cool on the inside. Clothes, blankets, cushions; anything that will fill the gaps can be used. It may not look so great, but at least you'll be nice and cool! All this processing consumes a considerable amount of energy, with many compact units using more than two kilowatts of electricity to keep you and the room you are occupying nice and cool. The old saying "You don't get something for nothing" springs to mind here. If you want to be cool no matter how hot it gets outside and no matter what he weather or humidity levels, a good quality compact air conditioner will do it for you as long as you're prepared for the cost of higher electricity bills. Running a 2kW appliance all day and probably most of the night as well will soon rack up a sizeable quarterly bill. Is There a Cheaper Alternative to AC? There is a cheaper-to-run alternative that will keep you cool during the hot summer, but it will only work if you live in an area that has relatively dry heat (low humidity). That alternative is called an evaporative cooler (sometimes referred to as a swamp cooler) and it works on the principle of cooling by evaporation of moisture. This type of appliance has little more than a fan and maybe an internal water pump to consume electricity and therefore uses around 1/20th the amount of energy as an AC of similar output. Another major advantage is there is no need to vent any air to the outside as no hot air is produced. This means there is no unsightly vent hose to worry about. You can read more about what are often referred to as portable air conditioners vent free by visiting the site via that link as they make fascinating reading. If it weren't for their lack of effectiveness in humid atmospheres, they would be the perfect replacement for air conditioning units large and small.